Earlier, we saw Al Borges unveil a heavy-I formation which featured two fullbacks and a tailback. It's not an unusual formation--lots of teams use it--but the pre-snap shift of Steve Watson from the fullback position was curious. It gave away Michigan's intentions and as such, Northwestern was able to stop Michigan on a third and one. On the next play, Denard would run the ball for an easy first down (about which more later). Later in the game, Michigan had the ball on the one yard line down 24-21. Devin Gardner was under center in the heavy-I formation seen earlier. Northwestern has loaded the box to stuff the run. Prior to the snap, Watson shows the same motion he had in the play before, stepping up to his left under the A gap. 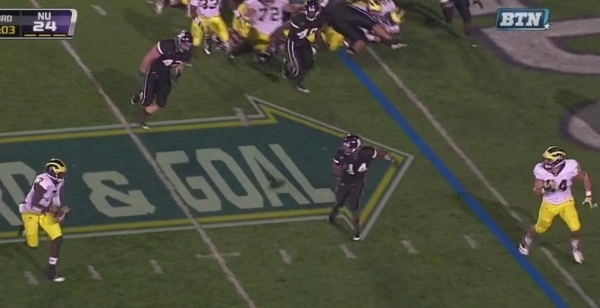 Like last time, a Northwestern linebacker begins to creep into that hole. As the ball is snapped, however, Watson plants his left foot and begins to pull across the formation. Gardner fakes the handoff to fullback Stephen Hopkins as Watson continues to pull behind the formation. You can see the penetration that the NW linebackers have gotten through the A gap. Hopkins stuffs the linebacker blitzing the A gap as Gardner rolls out with the ball. Brandon Moore released from the LOS to block the Northwestern safety, leaving only one slow-reacting linebacker to cover Gardner and Watson. Gardner has a run pass option and will outrun the Northwestern linebacker to the pylon. This is basically a one-time use play. Michigan intentionally showed this formation and pre-snap motion early in the game just in case this situation would arise. Now that they've shown it, this counter will be significantly less effective. In retrospect, the most interesting thing about the first play was the field position. Michigan was on their own 40 yard line in a third and one situation. After going for it with the heavy-I formation and failing, Hoke made the decision to go for it on fourth down. Given Hoke's rumored conservativeness (I say rumored, because he hasn't really shown it to date), this seemed like an obvious punting situation. In reality, knowing that the offense can almost always get one yard with a QB draw, Borges used this opportunity to show off this formation and pre-snap motion. The knowledge that Denard could convert the first down allowed Borges to reveal a play that was intentionally ineffective in order to set up an easy touchdown near the goal line. It's encouraging to see these one-off setup plays. Not only is Borges installing the base offense, it looks like he has one or two tricks for every team Michigan faces (see: Fritz formation, heavy-I formation). Borges is manufacturing touchdowns on a notepad. I'm curious to see how times he can unveil something like this. This is just great: the analysis, of course, but more so the fact that Borges is methodically putting his players in great positions to succeed. it was a good play, and i think it would actually work against a more athletic lb cause Gardner is fairly strong, and if I'm not mistaken Watson was pretty open for a 6 inch td pass. The whole "Hoke's rumored conservatism" thing, quite frankly, stemmed from laziness on the part of our blogging community. Rather than break down what kind of a coach he actually was, people (especially those upset over the coaching change) arbitrarily decided that Hoke must be a clone of Lloyd Carr and just dug out their old criticisms of Lloyd. Now people are beginning to see that Hoke is his own man.